The first article reviews the recent published update on PCA screening and diagnosis, as determined by review of the literature by an Expert Panel, in order to determine what is the current validated Evidence-Based Medicine Practice Guideline for American Urological Surgeons. The method of review is rigorously laid out and follows the accepted standard for publication. The emphasis in the study lies in the reliance on prostate specific abtigen (PSA), which has undergone an evolutioary improvement sine 1999, although substantiation of a benefit could not be trusted until almost a decade later. The problem the is notable is the absence of discussion of improvements in cancer imaging that has also evolved in that time period, and continues to evolve with molecular probes. When reviewing the DETECTION OF PROSTATE CANCER section on the AUA website , The first thing that catches one’s attention is the image below; clearly showing two “guys” exploring with interest what could be a CT or MRI image…. But, if you bother to read the review underneath this image regarding EARLY DETECTION OF PROSTATE CANCER: AUA GUIDELINE produced by an independent group that was commissioned by the AUA to conduct a systematic review and meta-analysis of the published literature on prostate cancer detection and screening; Panel Members: H. Ballentine Carter, Peter C. Albertsen, Michael J. Barry, Ruth Etzioni, Stephen J. Freedland, Kirsten Lynn Greene, Lars Holmberg, Philip Kantoff, Badrinath R. Konety, Mohammad Hassan Murad, David F. Penson and Anthony L. Zietman – You are bound to be left with a strong feeling that something is wrong! This must mean that: Notwithstanding hundreds of men-years and tens of millions of dollars which were invested in studies aiming to assess the contribution of imaging to prostate cancer management, no convincing evidence to include imaging in the screening progress was found by a group of top-experts in a thorough and rigorously managed literature survey! And it actually lead the AUA to declare that “Nothing new in the last 20 years”…..
My interpretation of this: It says-it-all on the quality of the clinical studies that were conducted during these years, aiming to develop an improved prostate cancer workflow based on imaging. I hope that whoever reads this post will agree that this is a point worth considering! “A systematic review was conducted and summarized evidence derived from over 300 studies that addressed the predefined outcomes of interest (prostate cancer incidence/mortality, quality of life, diagnostic accuracy and harms of testing). In addition to the quality of evidence, the panel considered values and preferences expressed in a clinical setting (patient-physician dyad) rather than having a public health perspective. Guideline statements were organized by age group in years (age<40; 40 to 54; 55 to 69; ≥70). RESULTS: With the exception of prostate-specific antigen (PSA)-based prostate cancer screening, there was minimal evidence to assess the outcomes of interest for other tests. The quality of evidence for the benefits of screening was moderate, and evidence for harm was high for men age 55 to 69 years. For men outside this age range, evidence was lacking for benefit, but the harms of screening, including over diagnosis and over treatment, remained. Modeled data suggested that a screening interval of two years or more may be preferred to reduce the harms of screening. After nearly a decade, my collaborators and I have found the first marker that specifically identifies the approximately six to eight percent of prostate cancers that are considered “aggressive,” meaning they will migrate to other parts of the body, at which point they are very difficult to treat. Although we have confirmed this marker, there is much to be done before a clinical application can be developed. Life sciences companies are gearing up for battle to capture the profitable prostate cancer molecular diagnostic market. Genomic Health and Myriad Genetics both made presentations to the investment community last week about their genomic tests that gauge a man’s risk of prostate cancer aggressiveness. As part of its annual investor day, Myriad discussed new data on its Prolaris test, which analyzes the expression level of 46 cell cycle progression genes and stratifies men’s risk of biochemical recurrence of prostate cancer. If the test reports low gene expression, then the patient is at low risk of disease progression, while high gene expression is associated with disease progression. Meanwhile, around the same time last week, Genomic Health launched its Oncotype DX prostate cancer test and presented data from the first validation study involving the diagnostic. The Oncotype DX prostate cancer test analyzes the expression of 17 genes within four biological pathways to gauge prostate cancer aggressiveness. The test reports a genomic prostate score from 0 to 100; the lower the score the more certain a patient can be that they can avoid treatment and continue with active surveillance. Prostate cancer patients who are deemed to be at very low risk, low risk, or intermediate risk of progressing are eligible to be tested with the Oncotype Dx test. If, based on standard clinical measures, a person’s prostate cancer is considered high risk, then he is not a candidate for Genomic Health’s test. These molecular tests are entering the market at a time when currently available tools aren’t specific enough to distinguish between men who have an aggressive form of prostate cancer and therefore, need invasive treatments, and those that are low risk and can do well with active surveillance. According to an NIH estimate, in 2010, the annual medical costs associated with prostate cancer in the US were $12 billion. It is estimated that each year 23 million men undergo testing for prostate specific antigen, a protein produced by the prostate gland that increases when a man has prostate cancer. Additionally, one million men get a prostate biopsy annually, while 240,000 men end up with a diagnosis for prostate cancer, and around 30,000 die from the disease. Although most of the men diagnosed with prostate cancer end up receiving surgery or radiation treatment, as many as half of these men will probably not progress, and their disease isn’t life threatening. While PSA testing has been shown to reduce prostate cancer deaths, a man’s PSA level may be increased for reasons other than cancer. As such, broadly screening men for PSA has been controversial in the healthcare community since the test isn’t specific enough to gauge which men are at low risk of developing aggressive prostate cancer and can forgo unnecessary treatments that can have significant side effects. Both Myriad and Genomic Health are hoping their tests will further refine prostate cancer diagnosis and help doctors gain more confidence in determining which of their patients have aggressive disease and which are at low risk. In this highly competitive space, Myriad has the first mover advantage, having launched Prolaris three years ago. The company has published four studies involving the test and conducted a number of trials analyzing around 3,000 patient samples. Researchers from UCSF and Myriad recently published the fourth validation study in the Journal of Clinical Oncology, which analyzed samples from 400 men who had undergone a radical prostatectomy. In the published study, researchers reported that 100 percent of the men whom Prolaris deemed to be at “low risk” of progression did not experience a recurrence within the five years the study was ongoing. Meanwhile, 50 percent of those the test deemed to be a “high risk” did experience recurrence during that time (PGx Reporter 3/6/2013). Like Myriad’s BRACAnalysis test, which comprises more than 80 percent of its product revenues, Genomic Health’s Oncotype DX breast cancer recurrence tests is bringing in the majority of its product revenues. However, the company believes that its newly launched Oncotype DX prostate cancer test stands to be its largest market opportunity to date. Last week, researchers from University of California, San Francisco, presented data from the first validation study involving the Oncotype DX prostate cancer test. The study involved nearly 400 prostate cancer patients considered low or intermediate risk by standard methods such as Gleason score and showed that when the Oncotype DX score was used in conjunction with other measures, investigators identified more patients as having very low risk disease who were appropriate for active surveillance than when they diagnosed patients without the test score. More than one third of patients classified as low risk by standard measures in the study were deemed to be “very low risk” by Oncotype DX and therefore could choose active surveillance. Meanwhile, 10 percent of patients in the study were found by clinical measures to be at very low risk or low risk, but the Oncotype DX test deemed them as having aggressive disease that needed treatment. Matthew Cooperberg of UCSF, who presented data from this validation study at the American Urological Association’s annual meeting last week, highlighted this feature of the Oncotype DX prostate cancer test to investors during a conference call last week. He noted that the test not only gauges which low-risk patients can confidently remain with active surveillance, but it also finds those patients who didn’t receive an accurate risk assessment based on standard clinical measures. “It’s also equally important that we identify the man who frankly should not be on active surveillance, because they’re out there,” he said. Genomic Health has aligned its test with guidelines from the National Comprehensive Cancer Network, which has expressed concern about over-diagnosis and over-treatment in prostate cancer patients. In 2010, NCCN guidelines established a new “very low risk” category for men with clinically insignificant prostate cancer and recommended that men who fall into this category and have a life expectancy of more than 20 years should only be followed with active surveillance. In 2011, NCCN made the active surveillance criteria more stringent for men in the “very low risk” category. I am quite surprised that nothing is said about the current status of PSA for Pca, which is far advanced today, and it also needs attention. We are in the old SUFI tale about the blind men who grasped the trunk, or the tail, etc., and called it the elephant. ► We simulate effects of analytical and sampling time variation on ProsVue slope. ► Classification switching is minimal in both stable disease and recurrence. The ProsVue assay measures serum total prostate-specific antigen (PSA) over three time points post-radical prostatectomy and calculates rate of change expressed as linear slope. Slopes ≤ 2.0 pg/ml/month are associated with reduced risk for prostate cancer recurrence. However, an indicator based on measurement at multiple time points, calculation of slope, and relation of slope to a binary cutoff may be subject to effects of analytical imprecision and sampling time variation. We performed simulation studies to determine the presence and magnitude of such effects. Using data from a two-site precision study and a multicenter clinical trial of 304 men, we performed simulation studies to assess whether analytical imprecision and sampling time variation can drive misclassifications or classification switching of patients with stable disease or recurrence. Analytical imprecision related to expected PSA values in a stable disease population results in ≤ 1.2% misclassifications. For populations with recurrent disease, an analysis taking into account correlation between sampling time points demonstrates that classification switching across the 2.0 pg/ml/month cutoff occurs at a rate ≤ 11%. In the narrow region of overlap between populations, classification switching maximizes at 12.3%. Lastly, sampling time variation across a wide range of scenarios results in 99.7% retention of proper classification for stable disease patients with linear slopes up to the 75th percentile of the distribution. These results demonstrate the robustness of the ProsVue assay and the linear slope indicator. Further, these simulation studies provide a potential framework for evaluation of future assays that rely on the rate of change principle. This article is followed by another in the Urology journal. NADiA ProsVue prostate-specific antigen slope is an independent prognostic marker for identifying men at reduced risk of clinical recurrence of prostate cancer after radical prostatectomy. Moul JW, Lilja H, Semmes OJ, Lance RS, Vessella RL, Fleisher M, Mazzola C, Sarno MJ, Stevens B, Klem RE, McDermed JE, Triebell MT, Adams TH. Urology. 2012 Dec;80(6):1319-25. http://dx.doi.org/10.1016/j.urology.2012.06.080. Epub 2012 Oct 26. To validate the hypothesis that men displaying serum prostate-specific antigen (PSA) slopes ≤ 2.0 pg/mL/mo after prostatectomy, measured using a new immuno-polymerase chain reaction diagnostic test (NADiA ProsVue), have a reduced risk of clinical recurrence as determined by positive biopsy, imaging findings, or death from prostate cancer. From 4 clinical sites, we selected a cohort of 304 men who had been followed up for 17.6 years after prostatectomy for clinical recurrence. We assessed the prognostic value of a PSA slope cutpoint of 2.0 pg/mL/mo against established risk factors to identify men at low risk of clinical recurrence using uni- and multivariate Cox proportional hazards regression and Kaplan-Meier analyses. The univariate hazard ratio of a PSA slope >2.0 pg/mL/mo was 18.3 (95% confidence interval 10.6-31.8) compared with a slope ≤ 2.0 pg/mL/mo (P <.0001). The median disease-free survival interval was 4.8 years vs >10 years in the 2 groups (P <.0001). The multivariate hazard ratio for PSA slope with the covariates of preprostatectomy PSA, pathologic stage, and Gleason score was 9.8 (95% confidence interval 5.4-17.8), an 89.8% risk reduction for men with PSA slopes ≤ 2.0 pg/mL/mo (P <.0001). The Gleason score (<7 vs ≥ 7) was the only other significant predictor (hazard ratio 5.4, 95% confidence interval 2.1-13.8, P = .0004). Clinical recurrence after radical prostatectomy is difficult to predict using established risk factors. We have demonstrated that a NADiA ProsVue PSA slope of ≤ 2.0 pg/mL/mo after prostatectomy is prognostic for a reduced risk of prostate cancer recurrence and adds predictive power to the established risk factors. Urology. 2012 Dec;80(6):1325-6; author reply 1326-7. http://dx.doi.org/10.1016/j.urology.2012.06.081. Epub 2012 Oct 26. Collins S.
Some patients who had surgery to remove the prostate may be at higher risk for recurrence. Determining the risk of recurrence is critical for these patients and their physicians in order to make the most informed decision possible about future medical management. seminal vesicle invasion (SVI, presence in the walls of the vesicles surrounding the prostate). The presence of cancer cells at the edge of the removed tumor (known as positive margins) or in the lymph nodes outside the prostate. A high preoperative PSA level (> 20 ng/mL). The tumor’s Gleason Score (if it is at least 8 or higher). However, current risk assessment relies on subjective and imprecise information. This uncertainty can have a dramatic impact on a patient’s personal experience after prostatectomy. The newly available NADiA ProsVue test may help provide a more clear and accurate prediction of a patient’s true risk for clinical recurrence. who are at reduced risk for clinical recurrence. In conjunction with other information, NADiA ProsVue may allow some men to avoid unnecessary treatments and anxiety after prostatectomy. rate of change of serum total prostate specific antigen (tPSA) over a period of time (slope, pg/mL per month). The NADiA ProsVue assay is performed for patients having less than 0.1 ng/mL serum tPSA values (determined by standard-of-care assays that are FDA approved/cleared) in the first sample collected more than 6 weeks after radical prostatectomy. NADiA stands for Nucleic Acid Detection immunoassay. Immuno-PCR, first described by Sano and Cantor in 1992 involves combining protein antigen detection by immunoassay with the detection sensitivity and precision of real-time polymerase chain reaction (qPCR). This amplified DNA-immunoassay approach is similar to that of an enzyme immunoassay, involving antibody binding reactions and intermediate washing steps. The enzyme label is replaced by a strand of DNA and detected by exponential amplification using qPCR. NADiA employs a soluble (reporter) monoclonal antibody (MAb) labeled with an assay-specific double-stranded DNA sequence. does the MAb interfere with DNA label amplification and detection. is coated onto paramagnetic microparticles. The reporter MAb-DNA conjugate is reacted with sample in a microtiter plate format to form a first immune complex with the target antigen. The immune complex is then captured onto paramagnetic particles coated with the second capture MAb, forming an insoluble sandwich immune complex. The microparticles are washed by several cycles of magnetic capture and re-suspension to remove excess reporter MAb-DNA conjugate. suspended particles to qPCR conditions and monitoring the generations of amplicon in real time. What are possible clinical applications? 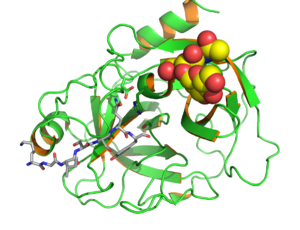 Proteins play a crucial role in all biological functions. Identifying and measuring the quantity of specific proteins is fundamental to understanding the cause and evolution of many human disease processes. There are hundreds of thousands of proteins in the human body, but the vast majority are present at extremely low concentrations. For example, only ten (10) proteins make up 90% of the mass of plasma proteins found in human serum. Twelve (12) proteins make up another 9% of the mass. The remaining proteins comprise the final 1%. Advancing medicine through the study of proteins (known as proteomics) requires powerful and sensitive tools. NADiA combines the specificity of an immunoassay with the detection sensitivity of qPCR and can assist efforts to provide clinical insight into many human diseases. Any disease process involving proteins below the detection limits of today’s enzyme immunoassays (EIA) is a potential target for NADiA. NADiA ProsVue is the first of a line of assays designed to advance human healthcare in the areas of oncology and infectious disease. NADiA® ProsVue™ is an in-vitro diagnostic assay for determining rate of change of serum total prostate specific antigen over a period of time (slope, pg/mL per month). The NADiA® ProsVue™ assay is performed for patients having less than 0.1 ng/mL serum total PSA values (determined by standard-of-care assays that are FDA approved/cleared) in the first sample collected more than 6 weeks after radical prostatectomy. ProsVue™ slope is indicated for use as a prognostic marker in conjunction with clinical evaluation as an aid in identifying those patients at reduced risk for recurrence of prostate cancer for the eight year period following prostatectomy. The NADiA® ProsVue™ assay is not intended for the diagnosis or for the monitoring of prostate cancer. †”Recurrence” is defined as clinical recurrence, not biochemical recurrence, and was documented by positive imaging, positive biopsy, or death due to prostate cancer. Three frozen serum samples drawn between 6 weeks and 19.4 months post-surgery. Patients were not eligible if they had received adjuvant radiotherapy and/or hormone therapy after surgery and prior to completion of the three post-surgical blood draws. The average (median) post-surgical Gleason score was 7.0 (range, 4 to 10). 73 patients had received neoadjuvant hormone therapy prior to their surgery. 116 patients had positive margins and 8 had positive lymph nodes. after median times of 4.9, 8.6, and 12.8 months and showed median values of 10.7, 23.0 and 50.7 pg/ml, respectively. The sensitivity, specificity, PPV and NPV for a 2 pg/mL/month ProsVue slope were 75.0, 96.6, 81.4, and 95.2, respectively. At a median follow-up of 10.5 years, 14 patients had died of prostate cancer and 40 had died overall. The authors conclude the the ProsVue test “provides information previously unknown” in patients in the first year post-surgery, and that a ProsVue slope of ≤ 2 pg/mL/month in that first year is highly associated with a lack of evidence of progression in long-term follow-up. In theory, the ProsVue test may have some clinical value in the identification of patients who do not need long-term oncologic follow-up and in predicting the need for adjuvant radiation therapy. However, additional prospective studies will be necessary before this can be confirmed, and the practical clinical value of such a test would depend on whether it is significantly more accurate that data currently available from ultrasensitive PSA testing. Additional information is available in a media release from the developer of the ProsVue test (IRIS International). According to that media release, the developer has submitted data to the FDA requesting approval to market this test. The centers involved in this study included Duke University, Memorial Sloan-Kettering Cancer Center, Eastern Virginia Medical Center, and the University of Washington — all of which are highly reputable institutions. NADiA ProsVue results are calculated as the linear slope of three NADiA ProsVue total PSA test results obtained on three serum samples collected between six weeks and 20 months post-radical prostatectomy. 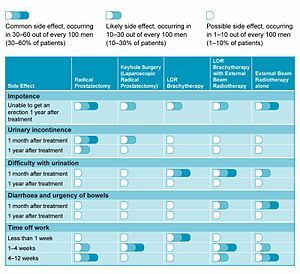 Introduction: Clinical recurrence after radical prostatectomy (RP) is difficult to predict since established factors do not reliably stratify risk. We validated a pre-specified hypothesis that a post-RP NADiA® PSA slope cutpoint of ≤2.0 pg/mL/month (mo) identifies men at reduced risk of clinical recurrence as determined by positive biopsy, imaging or prostate cancer death. This study aimed to compare the prognostic strength of the ProsVue slope cutpoint vs. surgical margin status to identify men at very low risk of post-RP clinical recurrence. Methods: From a cohort of 304 men, surgical margin data was available for 234 men. PSA was measured with a Nucleic Acid Detection Immunoassay (NADiA®) having a limit of quantification of 0.00065 ng (0.65 pg) per mL. Least-squares linear PSA slope (ProsVue™) was calculated using 3 serum samples drawn 1.5-20 mo post-RP. Recurrence risk using a 2.0 pg/mL/mo ProsVue cutpoint and surgical margin status were compared by two survival methods, univariate Cox proportional hazards regression analysis (table) and Kaplan-Meier plots (figure). Results: ProsVue slope ≤2.0 pg/mL/mo was significantly associated with a reduced risk of clinical recurrence by univariate Cox analysis (HR 18.3, 95% CI, 10.6–31.8, P < 0.0001). A negative surgical margin was less significantly associated with a reduced risk of recurrence (HR 3.3, 95% CI 2.0–5.4). Median time to recurrence for men with ProsVue slope ≤2.0 pg/mL/mo and those with negative margins exceeded 17.6 years (yrs). However, median time to recurrence in men with ProsVue slope >2.0 pg/mL/mo was shorter compared to those with positive margins. To validate the hypothesis that men displaying serum prostate-specific antigen (PSA) slopes ≤2.0 pg/mL/mo after prostatectomy, measured using a new immuno-polymerase chain reaction diagnostic test (NADiA ProsVue), have a reduced risk of clinical recurrence as determined by positive biopsy, imaging findings, or death from prostate cancer. The univariate hazard ratio of a PSA slope >2.0 pg/mL/mo was 18.3 (95% confidence interval 10.6-31.8) compared with a slope ≤2.0 pg/mL/mo (P <.0001). The median disease-free survival interval was 4.8 years vs >10 years in the 2 groups (P <.0001). The multivariate hazard ratio for PSA slope with the covariates of preprostatectomy PSA, pathologic stage, and Gleason score was 9.8 (95% confidence interval 5.4-17.8), an 89.8% risk reduction for men with PSA slopes ≤2.0 pg/mL/mo (P <.0001). The Gleason score (<7 vs ≥7) was the only other significant predictor (hazard ratio 5.4, 95% confidence interval 2.1-13.8, P = .0004). Clinical recurrence after radical prostatectomy is difficult to predict using established risk factors. We have demonstrated that a NADiA ProsVue PSA slope of ≤2.0 pg/mL/mo after prostatectomy is prognostic for a reduced risk of prostate cancer recurrence and adds predictive power to the established risk factors. Fifth–Generation Digital Immunoassay for Prostate Specific Antigen by Single Molecule Array Technology. Measurement of prostate specific antigen (PSA) in prostate cancer patients following radical prostatectomy (RP) has been hindered by the limit of quantification of available assays. Because radical prostatectomy removes the tissue responsible for PSA production, postsurgical PSA is typically undetectable with current assay methods. Evidence suggests, however, that more sensitive determination of PSA status following RP could improve assessment of patient prognosis and response to treatment and better target secondary therapy for those who may benefit most. We developed an investigational digital immunoassay with a 2–logs–lower limit of quantification than current ultrasensitive third–generation PSA assays. We developed reagents for a bead–based ELISA for use with high–density arrays of femtolitervolume wells. Anti–PSA capture beads with immunocomplexes and associated enzyme labels were singulated within the wells of the arrays and interrogated for the presence of enzymatic product. We characterized analytical performance, compared its accuracy with a commercially available test, and analyzed longitudinal serum samples from a pilot study of 33 RP patients. The assay exhibited a functional sensitivity (20% interassay CV) <0.05 pg/mL, total imprecision <10% from 1 to 50 pg/mL, and excellent agreement with the comparator method. All RP samples were well within the assay measurement capability. PSA concentrations following surgery were found to be predictive of prostate cancer recurrence risk over 5 years. The robust 2–log improvement in limit of quantification relative to current ultrasensitive assays and the validated analytical performance of the assay allow for accurate assessment of PSA status after RP.